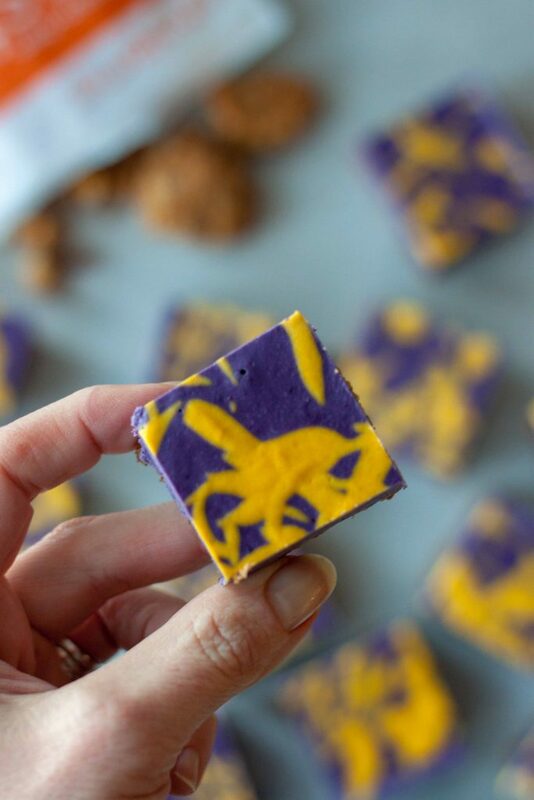 Some things, like a “Minnesota Miracle”, and only 1 game standing between the Vikings playing in the Super Bowl that just happens to be taking place in their stadium calls for Purple and Gold Skol Bars! I’m not a huge fan, but my husband is and I live in Minnesota so I got to pull out some purple pride with this recipe. There is so much going on over here and I’ll share more in the next 2 weeks but I’m going to have my hands full and if the Vikings win I think Minnesota will be madness and add to my stress the next couple weeks but I’m going to try to stay calm and just go with the flow. Luckily I have a few recipes already planned out and I still don’t know how I managed to make and photograph these yesterday to get them up. Don’t worry my blog won’t turn purple and gold, I promise. I have only one other recipe planned and it isn’t purple or gold, well maybe tator tots could be considered gold, but a fun twist on a Minnesotan food, Tator Tot Hotdish. I just had to with the Super Bowl being here break out a food from my home state. Skol is the Minnesota Vikings chant. When I looked it up I found it is a Danish/Swedish word for “cheers”, or “good health”, a salute or toast to an admired person or group. It isn’t the name I wanted to go with but everyone was telling me I had to have Skol in the name and after reading that I felt it fit so I went with it. 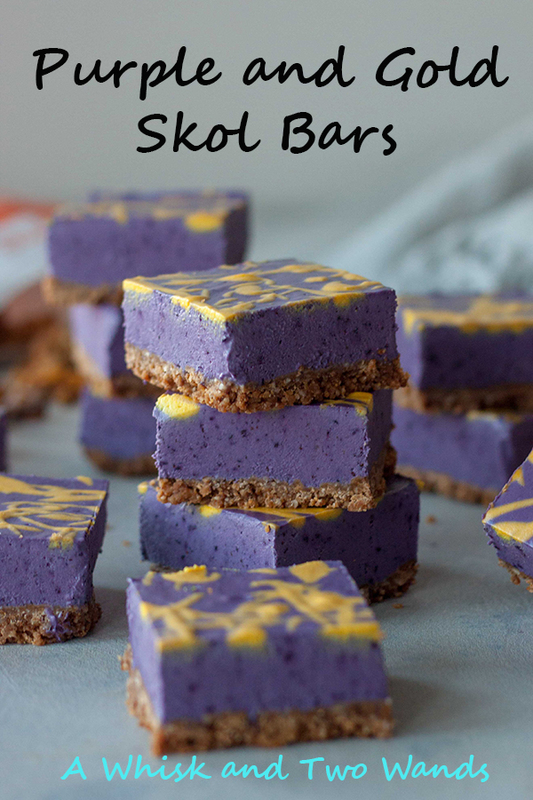 You don’t have to be a Vikings fan to make or enjoy these bars, you don’t even have to add the gold layer if you don’t want they are still delicious blueberry “cheesecake” bars. Basically a dairy free/ vegan no bake cheesecake layer but I made them with honey (our favorite local Minnesota Bare Honey) as there is already honey in the Minnesota made Whole Me Clusters I used in the crust. You can go one of two ways with the crust either Salted Peanut Chocolate as I did here or Lemon Blueberry Chia. This is basically a twist on my No Bake Blueberry Cheesecake Bars I posted last year using the Lemon Blueberry but blending in the blueberries to make a nice purple color and adding some gold fun. If you aren’t feeling the lemon you can make them as I did here with the Salted Peanut Chocolate Cluster crust, you don’t taste the chocolate really and it’s kind of a twist on a peanut butter and blueberry jelly sandwich. If you’re having a party to watch the game these make an easy snack or dessert. You do need to plan as you need to soak the cashews for at least 4 hours and you will need about 6 hours to chill the bars before cutting them. While my “assistant” tried to help cut into the bigger size I would usually cut them, 16 for a 8×8 or 9×9 pan, I feel that a smaller piece would be a good option as they are so rich. Since I couldn’t re-cut the ones already cut I went with it but still wanted to get the recipe up but I would go with cutting them into 25 instead of 16 and that’s what I will do the next time I make them. For another fun Viking inspired recipe check out my Purple Pride Bites on Instagram, only 4 ingredients in these wholesome bites that are a cross between fat balls and energy bites that are so good. I’m sure of it I’ve eaten over a dozen this week, I stopped counting. All in the name of recipe testing of course, or at least that’s my story. I didn’t have time to write a post and get the recipe up on the blog but I wanted to share it. Skol Vikings, let’s win this game! 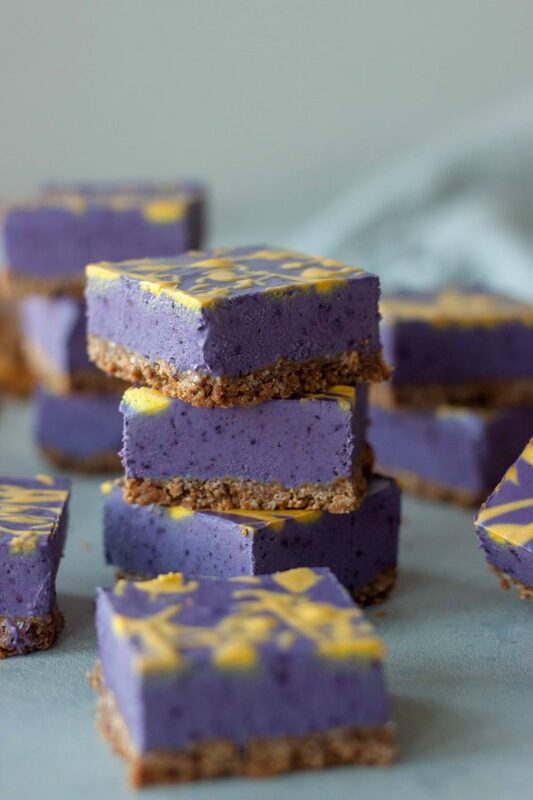 No bake dairy free blueberry cheesecake with a salted peanut or lemon blueberry chia crust. 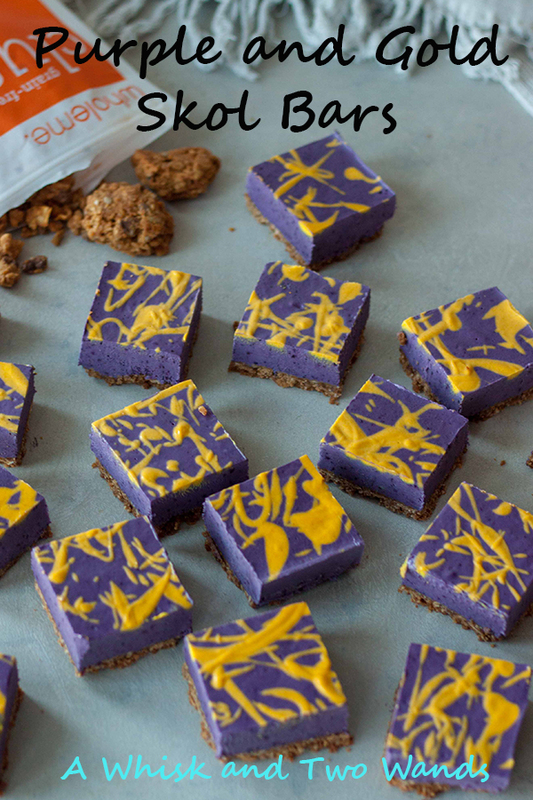 Easy to make ahead for game day (inspired by the Minnesota Vikings) or party! Gluten free, grain free, dairy free, paleo friendly. Soak cashews in filtered water in a glass jar for 4 hours or overnight. Prepare a 9×9 pan lining with parchment paper leaving overhang so you can lift the bars out and cut them. In a food processor pulse clusters until you have a coarse crumble. Add coconut oil and process a minute or two until combine. Press crust into the bottom of prepared pan. Place crust in the freezer while making the cheesecake layer. In a food processor, or Vitamix, pulse cashews until they are broken up as much as possible. Add coconut cream or coconut oil, lemon juice, honey, and vanilla blend until smooth stop to scrap the sides as needed. Remove 1/4/1-3 cup of the cheesecake mixture and put into a bowl and set aside this will be to make the gold on top, if you don't want that you can skip this step. Add blueberries to the remaining mixture still in your Vitamix or food processor and blend until smooth. The purple will get slightly darker as it freezes. Pour blueberry cheesecake over prepared crust. Lightly tap the bottom of your pan on the counter a few times to get out air bubbles. Add ground turmeric to the remaining cheesecake you set aside, add a little non dairy milk or golden turmeric milk if needed to blend only if needed. You want it to be slightly thinner then the blueberry layer so you can fling or drizzle it on the top. Drizzle or fling the gold layer on the top of the blueberry layer. Have fun, it's like flinging paint as a kid! Again gently tap the bottom of the pan on the counter to help the two layers settle. Place on a level surface in the freezer for 6 hours, or until serving. *If you don’t want to use, cannot find Whole Me Clusters, or want a vegan crust you can make with the pecan crust from this recipe. What a fun looking treat to serve on game day. These are too cute! You’re so creative, and of course it looks tasty too! These are so beautiful! The toppings remind me of wizardry, as though they could be part of a Harry Potter platter. These are simply beautiful! They look beyond delicious + incredibly nutritious! I cannot wait to make me a batch of these! As everyone has said these are just absolutely stunning! Im sure they taste good as well, but wow, just wow. These look unreal!! I cannot wait to make this! The color of these is enthralling! I can hardly tear my eyes away. I’m sure the taste is just as captivating! THAT GAME WAS BONKERS. 🙂 🙂 and when I first saw these, I immediately thought of my (several) MN friends… they will LOVE these! The texture of this cheesecake is so light and airy. I’m sure it will be a hit at your football parties! K.C. recently posted…It’s a Pie Buffet, Y’all! We’re fans of Maine Pie Co. Gluten-Free Pie. This is so perfect! I love the look of them and the fact that I can eat a few a week without feeling bad! 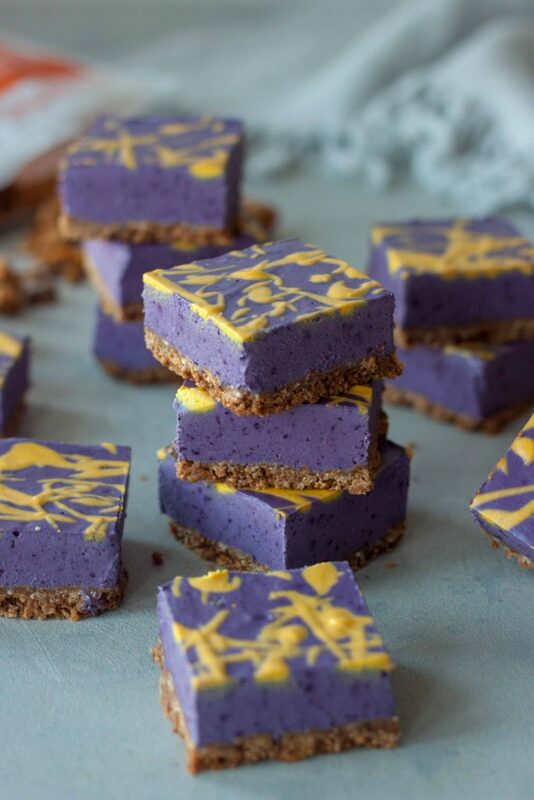 The colors of this cheesecake are amazing….it actually reminds me of Mardi Gras. The blueberries make it purplish. Regardless, this is one yummy looking recipe! These would be perfect for game day or any celebration – I think they could double as unicorn themed too. I LOVE the ingredients in here too – never thought I could enjoy cheesecake flavors again without the dairy. So cool! You add it to the blended cashews with the vanilla and lemon juice, sorry about that. The colours are so much fun! Gotta love the purple you get out of the blueberries. These are so awesome Sarah! Your creativity never ceases to amaze me. I was thinking of you yesterday when the game was on at the gym. 🙁 You were sending them all the good energy you could though with these bars! !